As part of that noble effort which is Obscura Day, why not come down to Coney Island, take in Morbid Anatomy's brand new exhibition "The Great Coney Island Spectacularium" (which opens the day before), check out Super Freak Weekend, and celebrate the premiere of season two of "Oddities" with free Hendricks Gin cocktails, episode viewing, and general revelry assorted cast members? Full details follow; really hope to see you there! Party in the Coney Island Museum to celebrate the opening of the Coney Island Spectacularium, super freak weekend, and meet the stars of the Discovery Channel show Oddities at the premiere of season two. 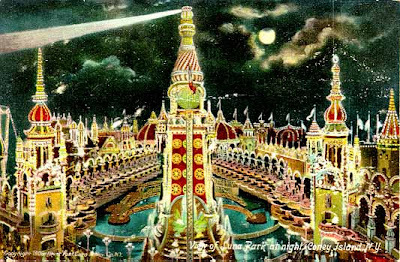 At the end of the 19th Century, Coney Island was the pinnacle of an astonishing era of live attractions – the Great Coney Island Spectacularium aims to recreate that momentous age, bringing you sites, sounds, and immersive experiences that can’t be seen anywhere else on earth. The attendees of this event will be the first to experience this taste of Coney Island at the height of its spectacle with the opening of the Coney Island Spectacularium. But that is only one part of this multi-faceted event! Also taking place is a sideshow performance by some of the countries best sideshow performers gathered in Coney for the annual super freak weekend. Topping it all off is the premiere of season two of the Discovery Channel show Oddities, with its stars Mike and Evan in attendance! Free Hendrick's Gin cocktails will be served upstairs, and there will be a cash bar (wine and beer) available downstairs. Doors open at 8:00, screening of the season premiere at 8:30. It’s also day two of the Congress of Curious Peoples, Coney Island USA’s 10-day series of lectures and performances about curiosity and curiosities, broadly conceived, so be sure to check out the schedule for the rest of the week..
Obscura Day is an international celebration of unusual places, happening all over the world on April 9, 2011. Visit ObscuraDay.com to see all of our 2011 events. To by tickets, click here. For more about the Great Coney Island Spectacularium, click here. For more about "Oddities," click here.